For a refresher on what the closing of the youth prisons will mean for Milwaukee, click here. Reports chronicled instances of abuse, excessive use of force and inadequate mental health care. Among them: the death of a 15-year-old boy who died after being pinned down by prison staff members. The U.S. Department of Justice opened investigations. Advocates pushed for change. And public outrage reached a boiling point. The failure in New York draws obvious parallels to Wisconsin’s situation with Lincoln Hills and Copper Lake youth prisons as both states have experienced moments of crisis that prompted significant changes to their youth justice systems. A new report from the Columbia University Justice Lab suggests that though not perfect, the path of reform that New York City took years ago has yielded largely positive results that could be a model for Milwaukee. Through an initiative called Close to Home, New York City restructured the way its youth justice system worked as a whole by moving its young people from state-run facilities upstate into community-based programs, and, in some situations, into small residential care homes with limited security measures in the city. By 2016, New York City stopped sending any of its children to state-operated youth prisons. Today, only about 100 youths in all of New York City are in any kind of residential facility, and there are only 12 who are in a locked facility. That’s out of a population of more than 8.6 million people. With less than a month until the deadline for Milwaukee County to submit its grant proposal to the state requesting funding to build and open a new locked facility in the city, researchers from the Columbia Justice Lab visited Milwaukee last week and spoke with leaders and advocates from the Milwaukee Community Justice Council, Youth Justice Milwaukee and Milwaukee County about its findings. They offered insight as well as concern regarding the state and county’s current plans for reform. Vincent Schiraldi, former commissioner of probation for New York City, one of the report’s authors and an expert witness who testified in the case against Lincoln Hills, warned of the danger of building a new facility with too many beds. So what’s the status of Milwaukee County’s reform plan? Mary Jo Meyers, director of Milwaukee County Department of Health and Human Services, agreed that services and programs need to be prioritized and said she talked with Kevin Carr, secretary of the state Department of Corrections, about the potential of having more locked facility beds than needed if both the county and the state build new centers. Although county and state leaders may question the need for multiple new facilities in Milwaukee, the county still is moving forward with its building plan. County officials remain committed to the current timeline to bring youths home from Lincoln Hills and Cooper Lake as soon as possible, which requires completing the grant proposal with facility plans by March 31. The county is purchasing land from the City of Milwaukee at either 6101 W. Mill Road or 6600 N. Teutonia Ave. and also is hiring a construction firm to build its new facility. Meyers said building a facility will cost $37.5 million, adding the county predicts a $2 million gap in financing. Act 185 only allocates $40 million for all of the county-run facilities throughout the state to compete in this grant process. Meyers said the cost accounts for creating space so the county can carry out its desired quality of programming–including green space and classrooms–as well as to maintain a ratio of 1 staff member for every 5 youths. The county-run secure facility will house about 40 beds, separated into pod units of about eight to 10 youths. Meyers said there will be one unit for girls and the rest will be for boys. She said the county has been working with the Annie E. Casey Foundation to forecast the number of beds it will need. 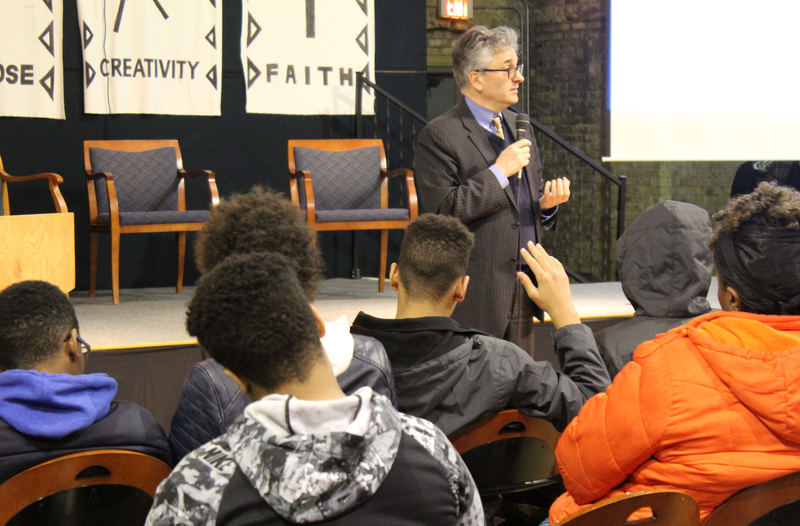 Schiraldi said New York City reduced the number of youths sent to residential placements by shifting its model from relying on institutions to investing in community-based programs and small homes. He said the first step leaders took was to re-evaluate and redefine which youth needed to be in custody. Stakeholders involved in different aspects of the youth justice system worked together to come up with a new criteria for sentencing and agreed that only youths they defined as high-risk would be placed out of their homes, he said. They were sent to home-like settings in the city that were unidentifiable from street view and housed no more than six to 12 youths. The city expanded its infrastructure of community-based programs to put lower-risk youths on a trajectory away from the justice system. This required buy-in and cooperation from judges and prosecutors. Schiraldi said leaders originally contracted too many beds for residential programs, out of fear of overcrowding, but that the opposite actually happened: The city ended up with extra, empty beds and had to cancel contracts with providers. Schiraldi said this was a good problem to have because it showed their approach worked. Besides contracting too many placements, New York City also struggled with youth running away from the facilities in its early months. In the following years, Schiraldi said leaders boosted staff training and came up with solutions to reduce the number of youths who ran away. New York City admittedly fell short in reducing racial and ethnic disparities in its system. Even after Close to Home, 90 percent of youth in the justice system were youths of color, and all of the youth placed in secure facilities were youths of color, even though youth of color comprise only 40 percent of the city’s youth population. A bill circulating in the state Legislature could delay the reform process by at least six months, postponing the closure of Lincoln Hills and Copper Lake until July 2021. Any changes in the funding will surface in budget discussions in the coming weeks and months. In his proposed budget, Gov. Tony Evers recommended modifying Act 185 so that the state could accept and review county grant proposals for facility funding on a rolling basis. The need for both state-run facilities and county-run facilities is part of the current language of Act 185, which requires youths in the Serious Juvenile Offender program to be placed in state custody. Mark Mertens, administrator for Milwaukee County Division of Youth and Family Services, said he would like to change the categorization of a Serious Juvenile Offender so more youths could remain under county care, but that classification is set in state statute. Local advocacy group Youth Justice Milwaukee has been advocating for utilizing and funding community-based programs such as mentoring, job training and mental health care instead of building new facilities since its inception in 2017. It has also voiced its preference for small, home-like care settings rather than larger facilities. In light of the Columbia Justice Lab case study, Moore said that the group will push back against the plan to build potentially two new facilities in Milwaukee County. Both the county and the state have proposed facilities on the city’s Northwest side.